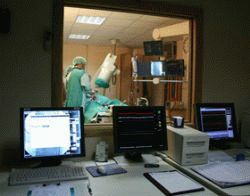 Specialists from the Davidai Cardiac Arrhythmia Center, which operates under the auspices of the Heart Treatment and Research Center at Chaim Sheba Medical Center, had recently began the practice of holding videoconferences with their colleagues – clinical arrhythmology experts from one of the world leading medical centers, the internationally acclaimed Mayo Clinic (USA). In the course of the videoconferences, complicated clinical cases are being discussed and joint decisions are made regarding the treatment courses of certain patients who suffer from difficult types of cardiac arrhythmia. Within the framework of the first videoconference of this kind, which was held last month, three complicated cases were discussed, two of which posed rare genetically preconditioned types of cardiac arrhythmia among young patients. The participants of this discussion were specialists from Davidai Cardiac Arrhythmia Center on behalf of the Chaim Sheba Medical Center as well as world renowned arrhythmology experts on behalf of the American Mayo Clinic. The head of the Davidai Cardiac Arrhythmia Center, Professor Michael Glikson says they are planning to continue this kind of virtual conferences on a regular basis, once every few weeks. “Modern technologies and telemedicine in particular opens great new possibilities for us. It allows us to easily present cases of patients, who are being treated in Israel, to world leading specialists in the field of children’s and adults’ cardiac arrhythmology – in real time – says professor Glikson. – We are planning to expand this new service and include other fields of cardiology in it”. This project poses one part of a wider cooperation between the Cardiology Center at Chaim Sheba Medical Center and the cardiology sub department at Mayo Clinic. The beginning of this cooperation dates almost three years back; within its framework, doctors from Sheba Medical Center go through qualification upgrading courses at Mayo Clinic. Doctors from both medical centers also participate in various joint projects of scientific research and annual international conferences and symposiums. In turn, experts from Mayo Clinic visit Sheba Medical Center from time to time with the purpose of giving lectures on cardiology and cardiac surgery, as well as performing various complicated surgical treatments and cardiac catheterizations in collaboration with their Israeli colleagues. According to Professor Zeev Rotstein, the CEO and Director of Chaim Sheba Medical Center, this kind of international cooperation is important not only for the improvement of quality in the medical services provided by the medical center, but also play a major role in the development of academic activity and scientific research.